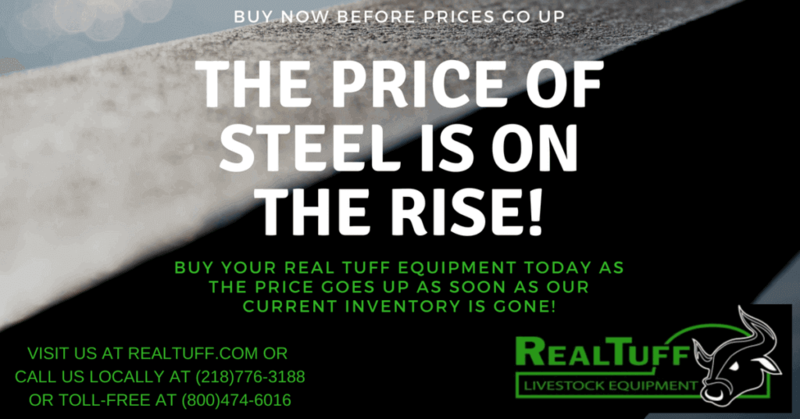 Our livestock equipment prices are on the verge of increasing from factors that are beyond our control. The price of steel in the United States is on the rise. This means that every piece of equipment we make is going to be a little more expensive in the near future. If you want to get as much savings as you possibly can, then the time to buy is now. We have some equipment ready to go, made with the steel that was lower priced. This means that you still can get what you need for a discount! Instead of waiting and paying more for the same piece of equipment you know you need, why not buy it now while the price is still low? To find out more, contact us here at Real Tuff. We would love to explain to you what we have available, as well as what we still have the steel on-hand to build. Reach out to us now – this offer only lasts as long as our current supplies do!